A magical caretaker by day and dedicated watchman by night, this Solar Yard Gnomes Tree Hugger will bring personality to your garden decor and a smile on your face. These colorful classic solar yard gnomes are fitted with a warm, LED bulb in their hats for accenting a tree or corner of a porch or house. 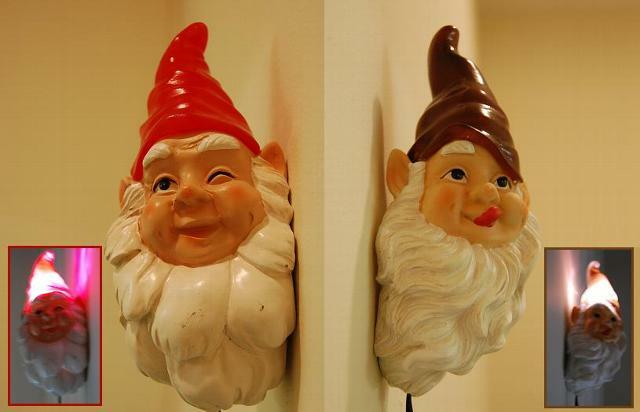 These gnomes are for posting on a tree or post, to give it that side-by-side feel. Each solar gnome is 7 inches tall and about 3 inches wide. 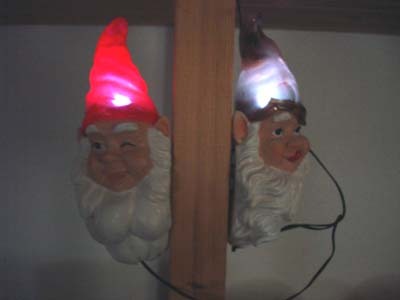 The cord between the gnomes is 15 inches long and the cord from the gnomes to the solar panel is 6 feet long. 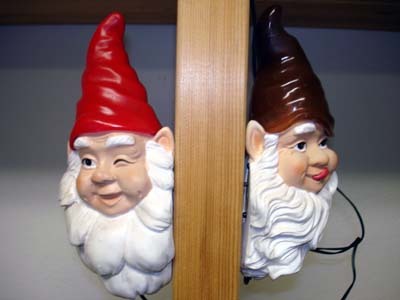 You place a nail or screw to any tree or post you wish to hang these gnomes from and presto a warm and inviting gnome to great you or just add a little magic to your garden or deck.